A specialist team serve our mining clients, managing the shipment of every item you need and offering total support. Mining offers unique, complex logistic challenges, not least in remote areas of the globe. Understanding these challenges and creating effective solutions can mean the difference between success, or failure. Alongside the ability to safely transport heavy, often over dimensional freight, Dynamic International consider the infrastructure of the country you are going to and their trading, or compliance requirements. We may have experience of working with mining companies in your destination but that will not mean an off the shelf plan, every company’s needs are unique. Professional planning is important to logistics management for mining. Often better if the planners also carry out fulfilment, their own staff and equipment contributing to a seamless operation. We can receive items into our warehouses, split orders into consolidated air and sea shipments according to client’s needs. Repacking, labelling, documentation and pre clearance inspections are managed by dedicated staff. Part or full charter can be organised, using carriers experienced in handling mining equipment. Our own handling equipment and vehicles can be put in place where appropriate, to ensure a timely solution. Shipping and logistics management are our vocation but our business is our clients. If your transport operation is flawless and you are happy, so are we. We believe that having every service in house helps. By ensuring a discipline of approach which suits the mining industry and covers detail, from shipment timing, to international clearance. Dynamic still wish to be more than a planner and shipper. We listen closely to you as a partner should, share experience and responsibility. If this approach appeals, we hope you will discuss your next project with us. 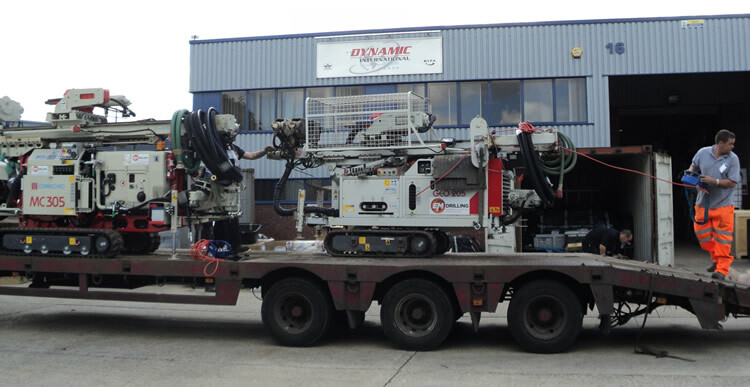 Moving mining equipment can be for the long term, to assist with temporary drilling, or for surveying new lands.